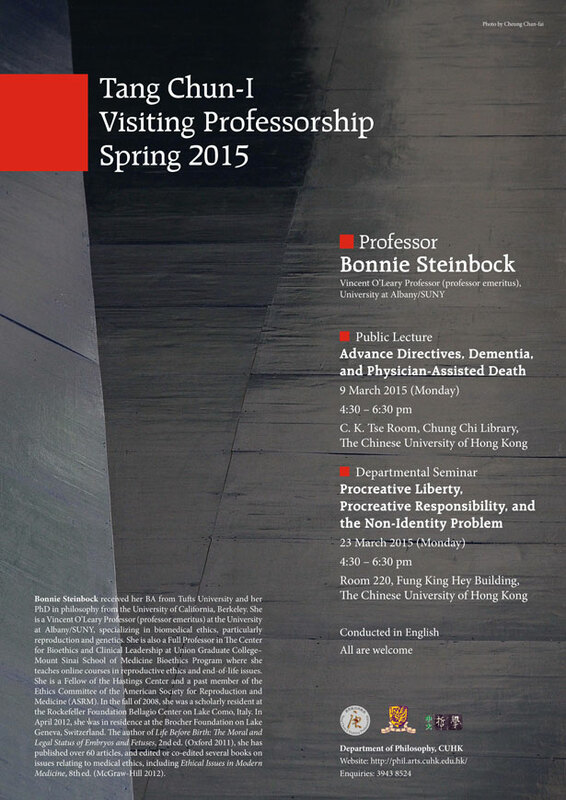 Date and Time: 23/3/2015 (Mon) 4:30 – 6:30 p.m.
Venue: Room 220, Fung King Hey Building,The Chinese University of Hong Kong. A common objection to new reproductive technologies or arrangements is the risk of harm they pose to offspring. Sometimes the issue is whether the risk of harm is real and well substantiated. However, it has been argued (for example, by John Robertson) that concern for the well-being of offspring can rarely, if ever, justify limiting procreative liberty, because it is often the case that, but for the technology or arrangement, the child would never have been born at all. I reject the claim that birth cannot be “unfair to the child” so long as the child is glad to have been born, and offer a decent minimum standard for procreative responsibility. Moreover, even when this standard is met, procreation can be irresponsible, in my view, if it is possible to have a different child without the harmful condition.